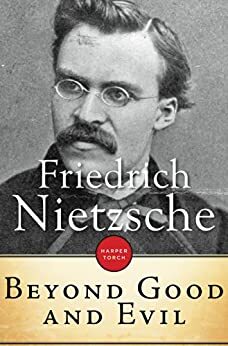 Friedrich Wilhelm Nietzsche’s Beyond Good and Evil is a critical response to metaphysical writings that try to define good and evil. Nietzsche advocates for an individualized way of thinking that focuses on the realities of life and that ignores traditional moral conventions, including religion, free will, and self-consciousness. 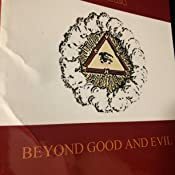 Divided into nine subjects areas, Beyond Good and Evil was written in a polemical style consisting of 296 short sections. 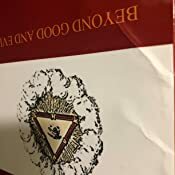 Published shortly after Nietzsche’s Thus Spoke Zarathustra, Beyond Good and Evil expands on and adds to the ideas of that previous work. "I obviously do everything to be "hard to understand" myself"
"One loves ultimately one's desires, not the thing desired." "The text has disappeared under the interpretation." "Objection, evasion, joyous distrust, and love of irony are signs of health; everything absolute belongs to pathology." "One must shed the bad taste of wanting to agree with many. "Good" is no longer good when one's neighbor mouths it. And how should there be a "common good"! The term contradicts itself: whatever can be common always has little value. In the end it must be as it is and always has been: great things remain for the great, abysses for the profound, nuances and shudders for the refined, and, in brief, all that is rare for the rare." "Madness is something rare in individuals — but in groups, parties, peoples, and ages, it is the rule." The eBook and the version of the paperback showing the two eyes in a frame are not the Kaufmann translation. This translation is OK, but you should know that the product information is incorrect. Additionally, the two versions I refer to use ALL CAPS instead of italics. Nietzsche loves his italics, especially in BGE. It's like he's screaming every other sentence. This is the third book I've read of Nietzsche's. The first was a collection from various writings, and the second was "The Anti-Christ." Beyond Good and Evil was Nietzsche's attempt to summarize his entire philosophy into one book. I don't know if I'd ever call anything Nietzsche wrote a summary, but this book does lay out his principles in black-and-white, and it did help me put some of the pieces together. Below are a few of my takeaways. It's not a summary, because I don't even know if that's possible. So I just wanted to share a few things I've picked up on. If modern (nineteenth century) man is no longer going to believe in God, or at least if they're going to tone down His influence a bit, the next logical step for them was the concept of free will. In a post-enlightenment world, people were trying to understand if there really is a God pulling our strings like puppets. If they weren't going to believe that, the next logical step was free will. Nietzsche rejects free will and instead believes in the will to power. Essentially the will to power is his phrase that means people should aim to take power over themselves and create a "superman" or "overman" out of themselves. Nietzsche sees this as an alternative to the concept of free will. Another thing that I noticed about Nietzsche after reading a fair bit of his work is that, as critical as he is of Christianity, he seems to have a bit of an affinity for Buddhism, or at least the principles of Buddhism. Buddhism's primary concept is "life is suffering," right? Nietzsche writes extensively about suffering as well, arguing in part that the cause of all great human advancement is suffering. In the Anti-Christ, he often points out that Buddhism is better than Christianity. To be fair, there was a pretty short list of things that weren't better than Christianity, according to Nietzsche. "Blessed be the forgetful: for they forget their stupidities, too." "Whoever reaches his ideal transcends 'eo ipso.'" "'Where the tree of knowledge stands, there is always Paradise': thus speak the oldest and the youngest serpents." This ebook is illegible. Someone just did an OCR scan of an existing translation, without fixing any of the problems. About once a sentence, two or more words are crammed together likethis. The written material in this book is acceptable but the book itself, that being the page is not upon opening the book I discovered this. The first three pages had the top right-hand corner are bent to an angle as to where they are not attached to the binding and thus make an indent into the cover of the book which ruins the pristine and beautiful image on the cover with a bulge that is clearly visible. I request a refund or at the very least new copy of this book that is free of misprints. Terrible print job, Create Space. Margins are microscopic, spacing is awful, text is crammed in so tightly I need reading glasses. Buy any other copy.